On this tab, you can manage how users interact with the board. Allowed users are the users that are allowed to access the board. All users checked here will be able to make changes to the board. 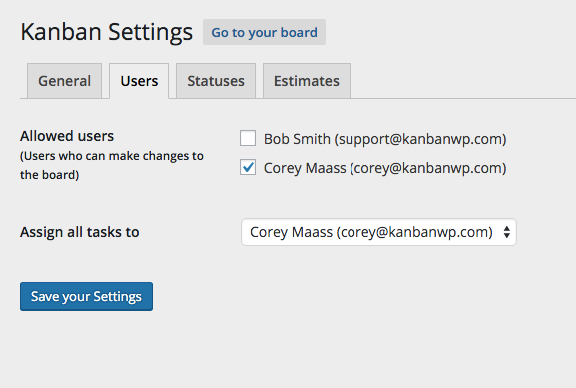 If you’d like to have users who can only see the board, please check out our Advanced User Management add-on. By default, when you create a new task, it’s unassigned. If you would like all tasks to be assigned to a specific user by default, set it here. Make sure the user you chose is also checked off in the “Allowed users” section above. To reset this, so any new task is unassigned, choose “No one” from the dropdown.